With over 300 five-star ratings on Goodreads, the Never Forgotten series is an award-finalist young adult paranormal romance series that will appeal to fans of Twilight by Stephenie Meyer, A Shade of Vampire by Bella Forrest, The Mortal Instruments by Cassandra Clare, Siren by Kiera Case, and The Vampire Diaries by L. J. Smith.In this coming of age story, Meara Quinn is about to find out there are worse things than moving to a tiny oceanside town before her senior year. 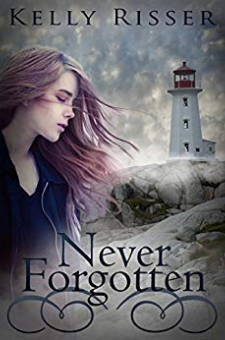 Like discovering there's a secret being kept from her and knowing it's a life-changer.After experiencing vivid visions of her absentee father, Meara decides she deserves answers. With the help of her new friend Evan, a guy she happens to be falling for, she embarks on a journey in the hopes of unlocking family history and finding her true self. But when she meets a handsome stranger at a local club who knows far more about her than he should,her world is again shaken. In him, Meara may have uncovered the key to the very secret that will reveal not only who she is... but what she is.The Never Forgotten series starts as a light paranormal romance with an Irish/Scottish folklore twist and grows into an under water urban fantasy where love, loyalty and friendship face the ultimate test. If you like mermaids, sirens, and other water fae you may not have met before, this series is for you.